Miguel is a lifestyle photographer, content creator, and Harley rider. Miguel is passionate about his Harley-Davidson and what it means to him. “I sort of discovered riding and photography at the same time really. I loved photographing my interpretation of the lifestyle, in a non-posing, non-staged way - REAL and TRUE and those are two very important values for me. I’ve made so many good friends on my bike, we share similar passions, and riding brought us together. Riding takes me ‘to the zone’, nothing else matters, just me and what’s ahead of me. I can detach from every day life, sounds cliche but it really means ‘freedom’ to me. Getting involved with Wiley X is a great achievement for me. When i’m riding my eyewear is super important. It needs to be functional yet stylish and quality - from Wiley X I get it all!." Rasmus Nielsen is a diligent Obstacle Course Racer, passionate Airsoft player and former professional cyclist. Rasmus owns and runs Copenhagen Warrior – an OCR race that focuses on creating some amazing racing experiences for the participants. Furthermore, Rasmus has participated in the TV2 program Korpset as aspirant #10, just to get ideas for new obstacles never before seen in the OCR world. Ben Ott is a sharp filmmaker & skilled photographer. He is the man who has shaped the media design of Thunderbike Customs in recent years, by being their PR marketing manager. Thunderbike is the largest Harley-Davidson® accessory supplier in Germany, the winner of countless screwdriver prices and a global player who is at the top of the list. It is in connection with Thunderbike that Ben got acquainted with Wiley X.
Fredrik Svelander aka Gamble is my name. My biggest hobby is airsoft and boxing. I work in the field of healthcare and besides that I am a combatmedic in the Swedish Armed Forces. As a person, I like to help and inspire people. Why Wiley X? - They are the only brand in my world. They both make me look good and provides me protection. Morten Dons is a Danish racecar driver with an enormous talent, and his resume emphasizes that: Danish Champion in Formel Ford, Swedish Champion in GT5 Challenge, and a Team Championship in British GT4. In 2015 Morten Dons proved his talent on the European scene when he won his first LMP3 race in the European le Mans Series at the Imola track. 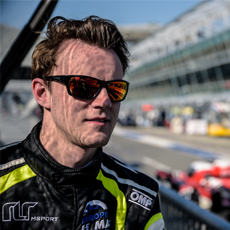 Morten Dons is currently chasing his dream of participating in the 24 Hours Le Mans and his 2017 season with RLR MSport / Mike Smith Motorsport gave him the experience he needed to advance to the LMP2 class, where he is expected to race in 2018 – opening the door to 24 Hours Le Mans. We at Wiley X will offer our full support, and we are thrilled about the opportunity to work with a talent like Morten Dons. "I'm very pleased to work with Wiley X. In motorsport you look at every single detail to achieve the maximum performance. I see the same high level of professionalism at Wiley X, which makes them a valuable partner for me on my road to Le Mans."